A quality dessert pear but requiring a warm location. Believed to have been raised by Van Mons in Belgium and sent to England c 1820. Named after Robert Thompson, Fruit Foreman at the RHS Garden, Chiswick, London. Medium to large sized fruit. Uneven and bumpy, oval to pyriform shape. 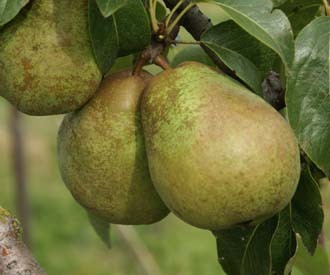 Rough, pale golden yellow skin up to half covered with brown russet. White, smooth, juicy flesh. Excellent, sweet, aromatic flavour. Moderately vigorous, upright tree. Fair but irregular cropping. Best grown in a warm location. Attractive red autumn foliage.